As we prepare for a critical midterm election, it's worth recalling another one, in which California voters rejected a virulently homophobic ballot measure. A lot of people are saying this year’s midterm election is the most crucial of our lifetime. It may well be, given the need to elect officials who will fight Donald Trump’s loathsome agenda. But another midterm election, 40 years ago, was one of the most crucial as well, at least in California. 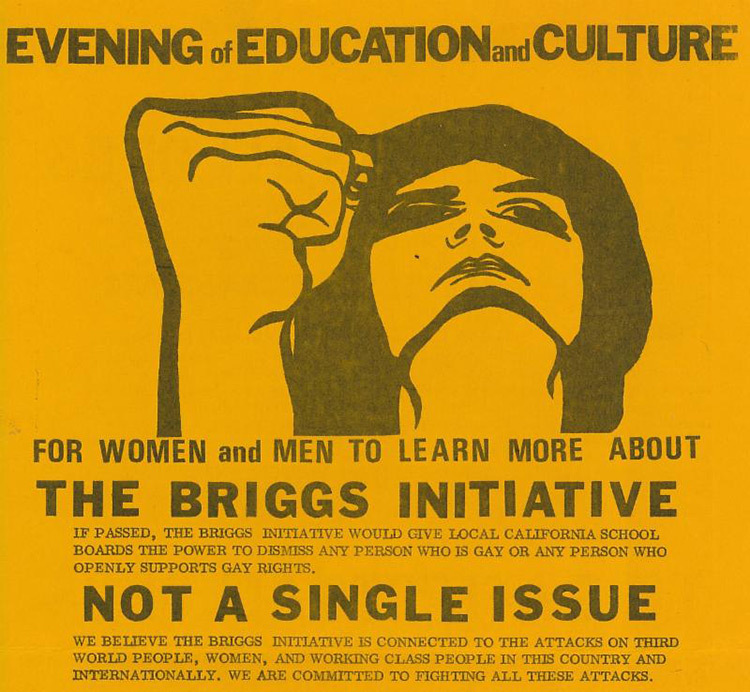 To mark the 40th anniversary of this milestone, the GLBT Historical Society in San Francisco is mounting an exhibition called “The Briggs Initiative: A Scary Proposition,” recounting the story of the initiative and how it was turned back. It opens September 14. Indeed, there are similarities between 1978 and today. The gay rights movement jump-started by the Stonewall riots and other events of the 1960s had made some gains in the 1970s. Gays and lesbians were getting elected to state- or city-level public office, or coming out and getting reelected — Elaine Noble in Massachusetts, Allan Spear in Minnesota, Harvey Milk in San Francisco. Many cities and counties, including San Francisco and Miami-Dade County, were adopting ordinances banning antigay discrimination. Major cities across the nation were holding Pride parades, usually around the anniversary of Stonewall in late June. The American Psychiatric Association announced it no longer considered homosexuality a mental illness. This amount of progress pales in comparison with that of the 21st century, which brought nationwide marriage equality, many more antidiscrimination laws, and, for a time, a president who wholeheartedly supported LGBTQ equality. But just as the Trump administration and other anti-LGBTQ forces are trying to undo civil rights progress today, homophobes came out of the woodwork to try to strip away the advances of the 1970s. The Briggs Initiative was part of this backlash, as was Anita Bryant’s campaign to repeal the Miami-Dade County gay rights law. But where she succeeded, Briggs would fail. Briggs was a far-right Republican from a district in Orange County, a conservative enclave between Los Angeles and San Diego. In a state that makes greater use of the citizen initiative process than almost any other that has it, he hoped Prop. 6 would boost his political career. Specifically, he aspired to become California’s governor. But one of the forces who helped persuade voters to reject the initiative was a former governor — Ronald Reagan. When he became president a few years later, Reagan didn’t build a gay-friendly record — he courted the religious right and notoriously ignored the AIDS crisis. 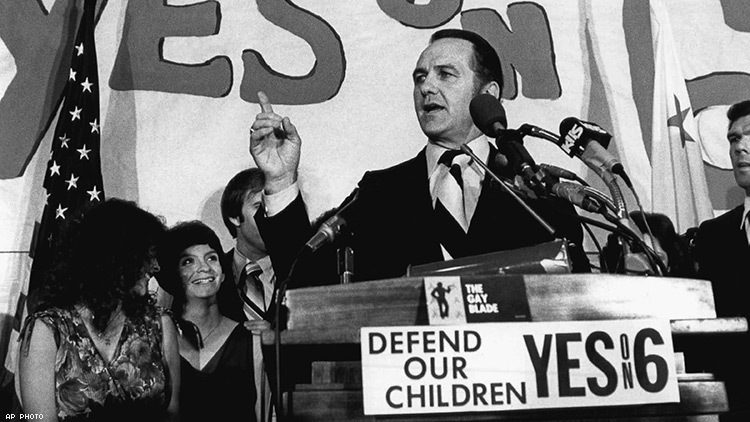 But in 1978, he announced his opposition to the Briggs Initiative in an informal letter and in responses to reporters’ questions, and on November 1, six days before the election, he published a commentary in the Los Angeles Herald-Examiner denouncing the measure. “Whatever else it is, homosexuality is not a contagious disease like the measles,” he wrote. “Prevailing scientific opinion is that an individual’s sexuality is determined at a very early age and that a child’s teachers do not really influence this.” That language may sound pretty tepid now, but at the time it was a significant statement. Then-President Jimmy Carter and his predecessor, Gerald Ford, also opposed the initiative. But the credit for defeating the Briggs Initiative really should go not to high-profile politicians but to the many grassroots activists who worked against it. The opposition started with gay and lesbian advocates and the women’s movement, but they formed alliances with organized labor, progressive religious groups, and community organizations representing a variety of populations. 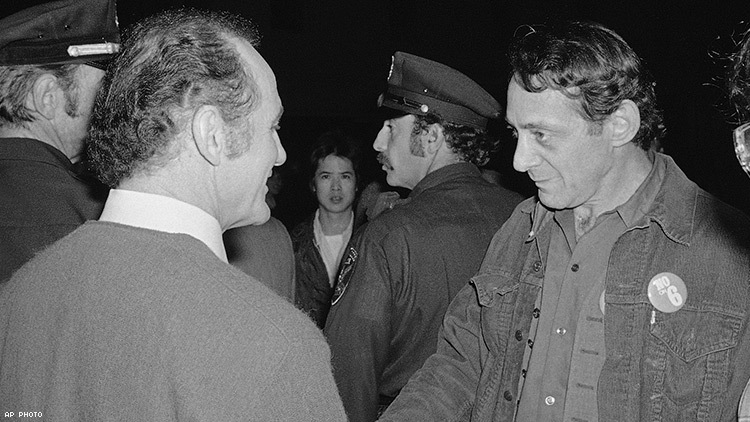 Milk and Gearheart famously debated John Briggs, as chronicled in the documentary The Times of Harvey Milk and the narrative film Milk (although the latter left out Gearheart). They made mincemeat out of Briggs's arguments, particularly about his initiative being a way to combat child molestation; Gearheart cited government data showing that this is overwhelmingly committed by straight men. Indeed, gay people and their allies managed to flip the script on the initiative, as Ramy K. Khalil noted in his Western Washington University master’s thesis on the campaign. In August, just three months before the election, opinion polls showed support for the measure at 61 percent, opposition at 31 percent. By September, the polls showed a toss-up. And on November 7, voters delivered a resounding defeat, with the proposition losing by a margin of 58.4 percent to 41.6 percent, and not even carrying Briggs’s home county. The exhibit at the GLBT Historical Society will pay tribute to this grassroots work. Englander and her co-curators, Paula Lichtenberg and Glenne McElhinney, all were involved in the fight against Prop. 6. They have assembled a collection of posters, buttons, flyers, photographs, videos, and other scarce materials from the archives of the GLBT Historical Society and the San Francisco History Center of the San Francisco Public Library. The curators will speak at an opening reception to be held at 7 p.m. September 14 at the Historical Society, located at 4127 18th St. The exhibition will be up until January 20. Admission is to the Historical Society is free for members and $5 for nonmembers. Find more information here. And watch a clip from the Briggs debate below.